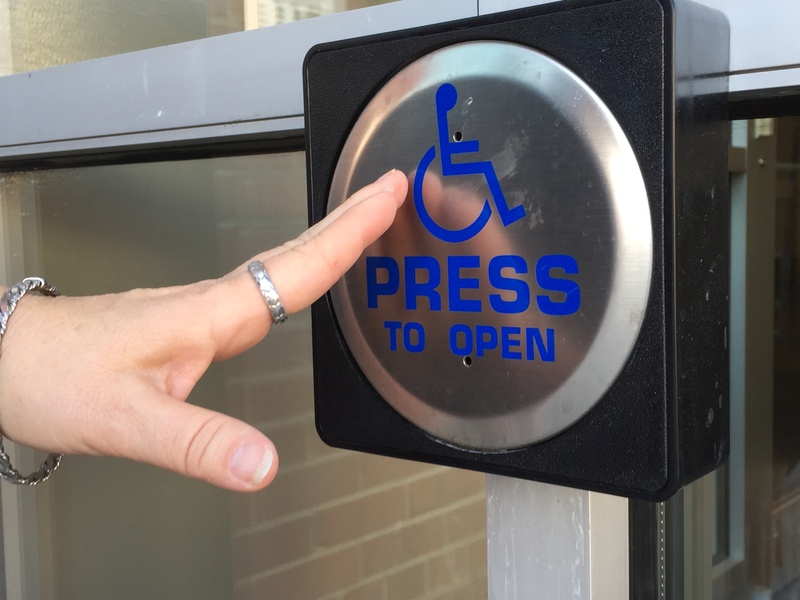 You rush up to a building and it’s so cold out that you hit that magical door opening button, also known as an ADA button, so you don’t have to touch the handle. The door swings open for you and you scamper inside. You’ve done a good deed, right? You kept your hands cleaner, used a button that is meant to be used, and in the case of the DOC and Clarkson, didn’t use the big revolving door to sweep cold air into the building. Those are all good thoughts, but unfortunately, wrong. ADA buttons are designed to be used by people who cannot hold the door open for themselves while safely getting through the doorway. They can also be used in areas where large items, generally carts or beds, will be taken through and the door needs to be held open. ADA doors are still designed to be used manually. Even if you can hear the gears moving, you are not damaging them. If you are still concerned, use the door on the other side. Our EVS staff cleans door handles and ADA buttons regularly as part of infection control. However, the area you touch on a door is larger and you are more likely to touch a different area there, than you would on an ADA button. Not necessarily dirtier, but definitely not any cleaner. ADA doors are often used by individuals who believe they need to use them and doors stay open much longer than they would otherwise, letting in a lot of cold/hot air. In addition to making people in the adjacent areas uncomfortable, we use a LOT of energy to counter that change in temperature. In the case of the DOC or Clarkson revolving door, that door actually helps maintain pressure in the building and does not bring in a lot of outside air. The ADA door stays open and allows air to be sucked right into the building, making the lobby and atrium cold/hot until our system can catch up. Who knew such a little action could have such a big impact? Think before you hit the button next time, and only use it if you need to; you’ll save energy and make spaces more comfortable for employees and visitor. Plus, you don’t turn out like this guy!